Woodworking has been in vogue lately and a lot of people have been going crazy over scroll saws. While the professional woodworkers flood the YouTube with unpacking and demo videos of their shiny new scroll saws, several others are being inspired to take up woodworking as a hobby. With the rise in demand for basic, easy-to-use equipment, a lot of reputed brands like Ryobi, Craftsman, Dewalt Rockwell and Genesis have doled out a range of affordable, entry-level scroll saws for the beginners. Ryobi Power Tools have thrown their hat in the ring by launching the Ryobi ZRSC164VS 16-Inch Variable Speed Scroll Saw. Let’s take a look at the specifications. Lightweight saw with enhanced portability. The Accuclear dust blower keeps the sawdust off the work table so that you can operate on a clean area hence focus on cutting. No assembly required. The saw comes with a perfectly tensioned, pre-installed 5-inch pin blade and is ready to use right off the box. Adjustable speeds make it easier to work on different types of wood and soft metals. Changing the blades is a hassle-free process and does not require any tools either. Since the work table is made from cast aluminum, it is not durable, neither is it sturdy enough. 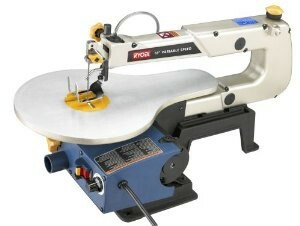 Though the Ryobi Scroll Saw is lighter, it impedes its stability and precision while the saw is in use,which may reduce its effectiveness to a considerable extent though. The vibration can hinder the cutting accuracy and may also pose risks to the operator. The Ryobi Scroll Saw weighs 14 kg. The physical dimensions are 13” x 26.4” x 14.4”. The saw runs on a powerful 1.2 A, 60 Hz motor that uses 120 Volt. It facilitates change of speed which varies between 550 and 1600 SPM. The depth of the throat is 16 inches, which offers decent cutting surface area to volume ratio. The cast aluminum work table can be tilted up to 45 degrees to either side. It takes a lot of weight off the saw, making it easy to haul around. The saw supports both pin-end and plain-end blades to achieve cuttings of different styles on different kinds of material. The built-in Accuclear dust blower keeps the work table clean and free from sawdust and enhances the visibility while the saw is in use. The saw has an integrated 1.25” dust port that can be attached to the shop vacuum for easy cleaning. The Ryobi Scroll saw comes with one year warranty. Despite all its shortcomings, the Ryobi Scroll Saw is a versatile piece of equipment. Like we mentioned before, it is best suited for entry-level users only. Heavy use can cause significant damage to the work table and throw the saw’s functionality into disarray.